There is no denying the influence and wild popularity that the comic book world continues to have on our broader culture. Just look at what happened when Avengers: Endgame tickets went on sale recently: Tickets wound up selling for thousands of dollars on the secondhand market. Now, there’s a one-of-a-kind exhibit coming to a local museum to explore the impact of comics on the art world. "Beyond the Cape! 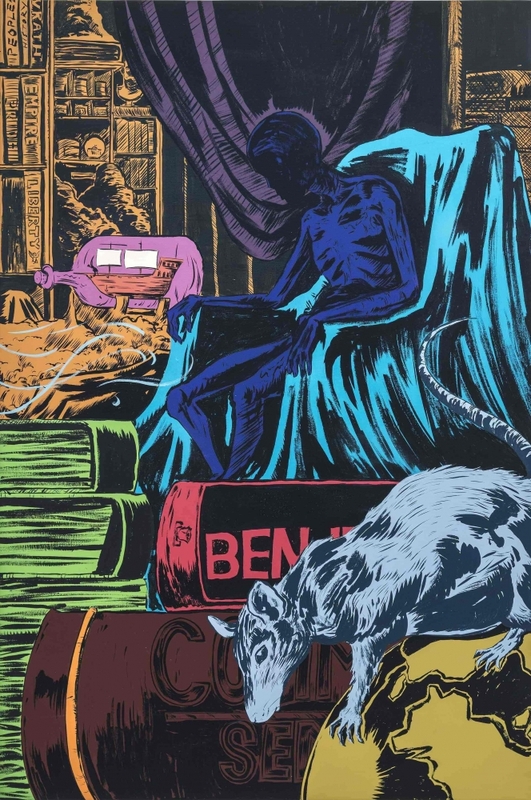 Comics and Contemporary Art" opens at Boca Raton Museum of Art on Tuesday, April 16, showcasing works by contemporary artists who have been influenced by comic books and graphic novels. The show features more than 80 works by 40 artists, including paintings, video, photography, sculptures, prints, drawings, and tapestries. Featured artists include the likes of Kumasi J. Barnett, George Condo, Renee Cox, Liz Craft, Kota Ezawa, Chitra Ganesh, and Mark Thomas Gibson. Among the unique nuggets you’ll spot is Kerry James Marshall’s powerful comic series Rhythm Mastr, which he’s been working on for the past 20 years. The series takes viewers on an impactful journey documenting violence in Chicago in the 1990s through today's ongoing civil rights battles. Many of the pieces throughout "Beyond the Cape" touch on some of today’s most divisive yet vital issues, including immigration, LGBTQ equality, and religion. “Dating back to Superman battling fascism, comic books have always had a tradition of storytelling ... and oftentimes connecting with the present times,” says Lippman. Rare comics from the early 1900s will also be on display at the museum, and there will be more than 200 graphic novels and comic books for folks to cozy up to in an IKEA-sponsored reading room. Beyond the Cape! Comics and Contemporary Art. Opens Tuesday, April 16 and runs through Sunday, October 6, at Boca Raton Museum of Art, 501 Plaza Real, Boca Raton; bocamuseum.org. Standard adult admission costs $12 with various discounts available.